The holiday season will be here soon. It’s also the season for entertaining friends and family. Take a deep breath and forget the picture of the stressful holiday season that just popped in your head. I’ve got tips and tricks to help you glide through the season with ease and actually enjoy it. Plus, your guests will love my Orange Sweet Rolls and you’ll love that you can do the prep work way ahead of time. I learned a long time ago that guests enjoy your presence more than an overly complicated multi-course meal. When I’m entertaining, I almost always serve meals buffet style. I can set the dining table the night before and serve everything buffet style from the kitchen island. 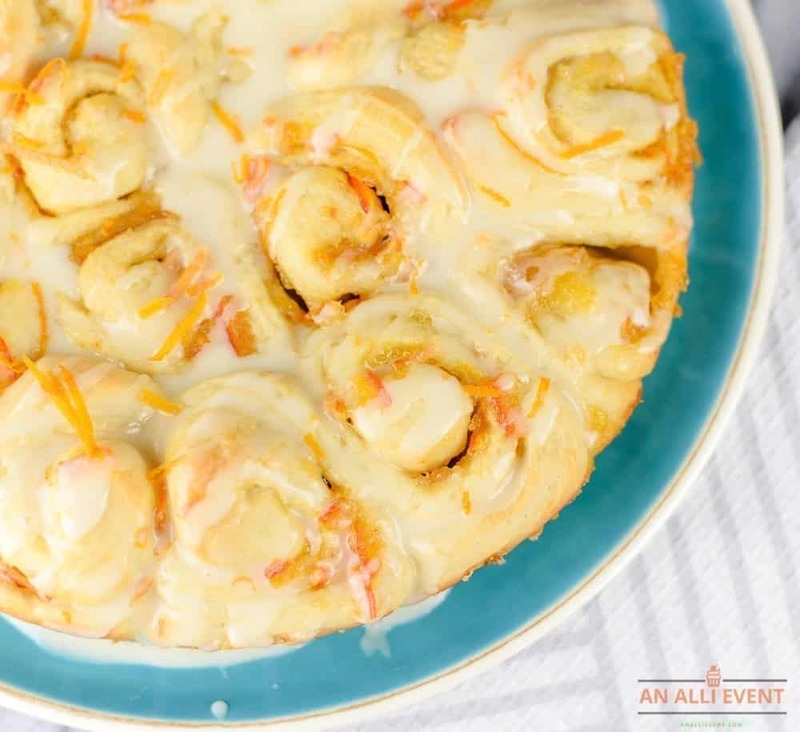 When it comes to overnight holiday guests, I like to serve a casual breakfast or brunch that includes Make Ahead Orange Sweet Rolls. I’m such a citrus lover and these sweet rolls are filled with brown sugar and orange marmalade. 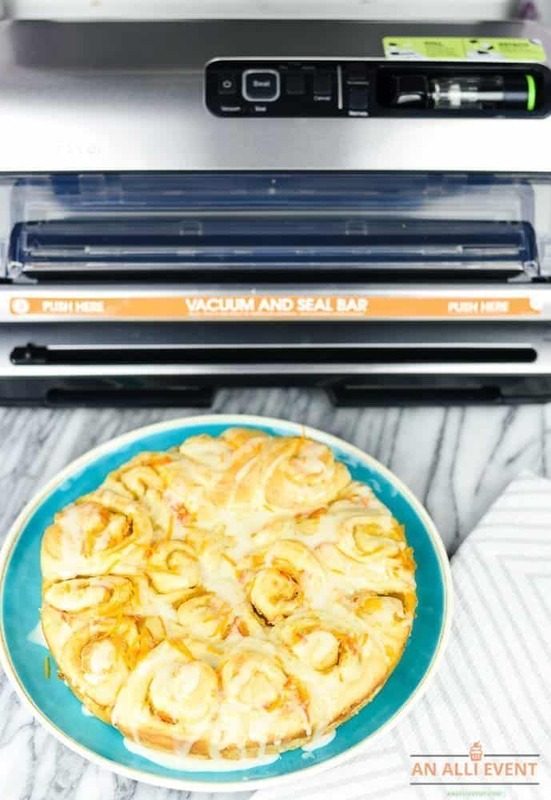 I do most of the prep work ahead of time and once the orange sweet rolls are baked and cooled, I vacuum seal the orange rolls with my FoodSaver® FM5330 Vacuum Sealing System. My rolls remain fresh and I’m able to relax, knowing that the orange rolls are ready to thaw, heat, frost and serve. 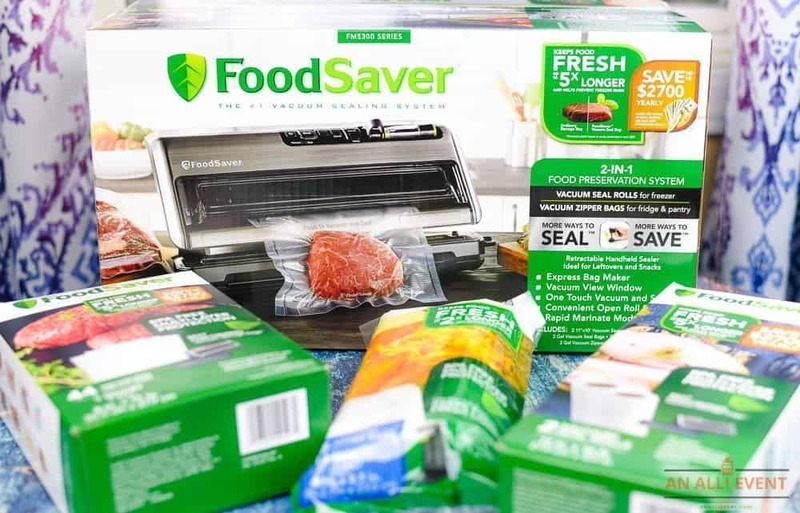 The FoodSaver® FM5330 is my go-to solution when I need to save time. Not only do I use this system to cook ahead of time, but I can also marinate foods in minutes instead of hours. Plus, FoodSaver® keeps foods fresh up to 5x longer than the storage methods I once used. No wonder FoodSaver® is the number 1 Vacuum Sealing solution in the USA. 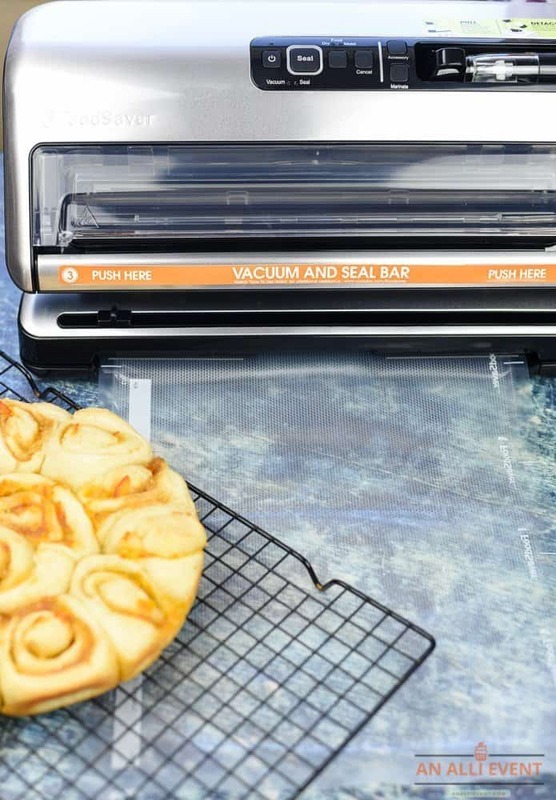 The Foodsaver® FM5330 helps keep my Orange Sweet Rolls fresh in less time with fewer steps. * There’s less bag waste* and the Easy View Vacuum Window always assures me that I’m getting an airtight seal. This is one of the many reasons I love this sealing system. 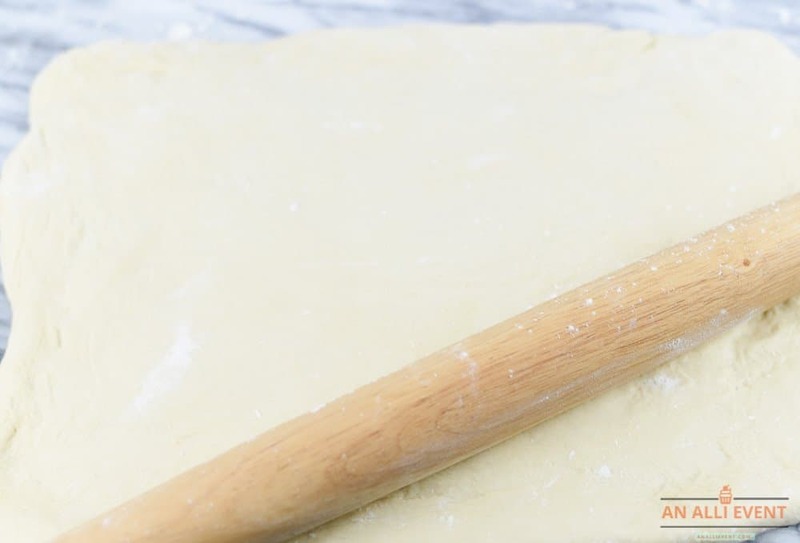 On a lightly floured surface, roll out the thawed bread dough into a 15″ x 10″ rectangle. Rolling the bread dough will give your arms a good workout. 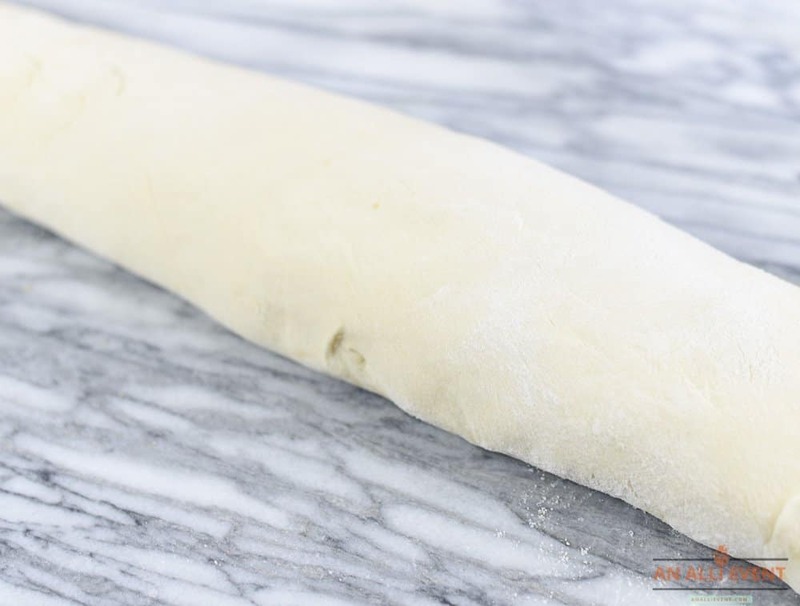 The thawed dough will be much easier to roll if you let it rest on the kitchen counter for 15 minutes before rolling. Stir together orange marmalade and softened butter. 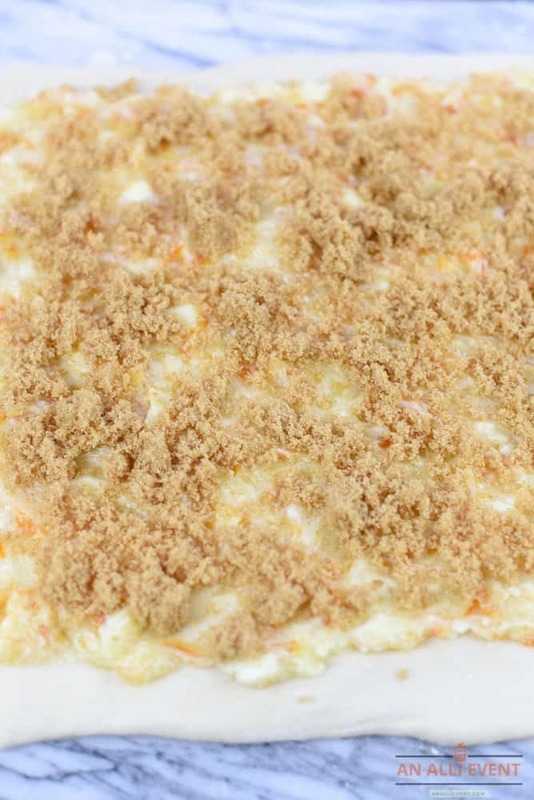 Spread the mixture onto dough, leaving a 1″ border. Sprinkle half of the brown sugar evenly over butter mixture. Roll up, jelly-roll style, starting at one long side. Pinch edges to seal. Cut rolls into 1″ thick slices and place in 2 lightly greased cake pans, with sides touching. Cover and let rise in a warm place, free from drafts, for an hour or until doubled in bulk. Bake the Orange Sweet Rolls for 16-18 minutes or until golden brown. Cool in pans on wire racks for 5 minutes. Invert rolls and cool completely. 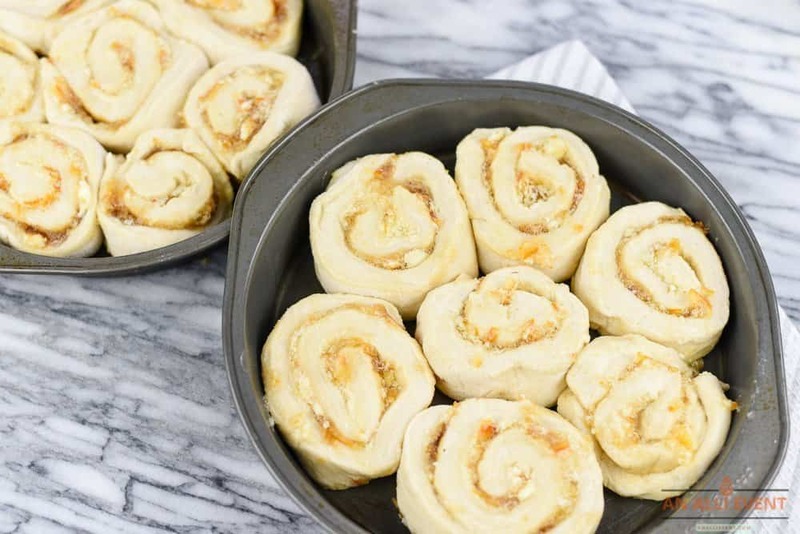 Helpful Hint: Orange rolls are delicate, so they need to be placed on a cookie sheet and frozen for several hours or until completely firm before sealing. Once the rolls are frozen, I follow the easy directions that come with the Foodsaver® FM5330. First, I make sure I have a roll installed. To make the first bag, I close the lower seal and cut bar. Then I turn the lever to seal position. When the red light turns off, the seal is complete. Then I turn the lever to the unlock position and pull out the pre-sealed roll to measure my bag. When I have the size bag I need, I turn the lever back to the seal position to make the seal of the next bag. I then slide the bag cutter across to cut the bag. I love that every time I turn the lever to seal, I’m creating my next bag. It’s such a simple process. 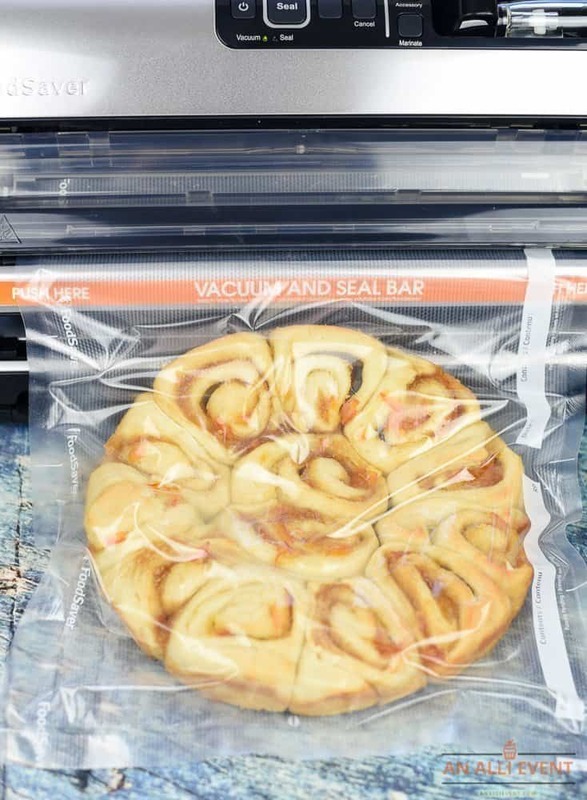 Once I place the frozen Orange Sweet Rolls in the bag, I vacuum and seal the bag by inserting the open end of the bag through the bottom of the vacuum view window. Once the bag is in place, I push and release the vacuum and seal bar. When the red seal light turns off, the process is complete and the Foodsaver® FM5330 will release the sealed bag. Then I pop the bag in the freezer and my orange rolls are ready and waiting for my holiday guests. When it’s time to serve, thaw completely and heat in a 350º oven just until warm. Drizzle the warmed orange rolls with icing. On a lightly floured surface, roll thawed bread dough into a 15x10" rectangle. Stir together orange marmalade and softened butter. 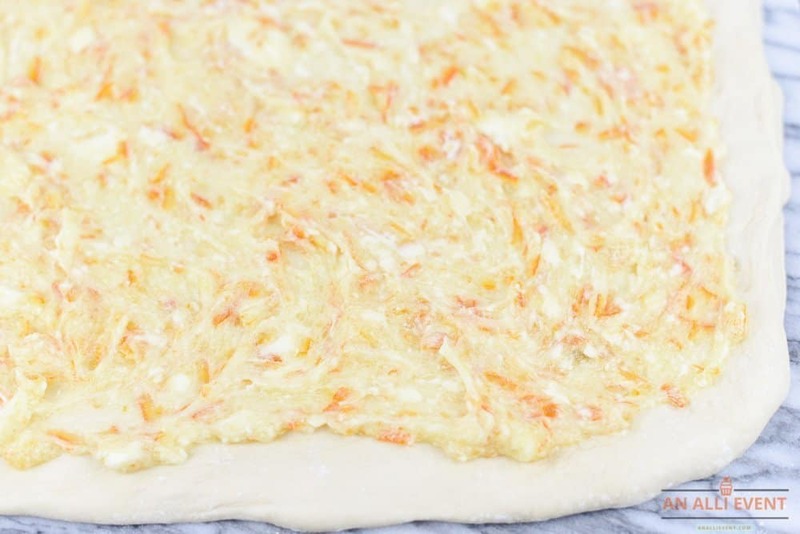 Spread mixture onto dough, leaving a 1" border. Sprinkle brown sugar evenly over butter mixture. Roll up, jelly-roll style, starting at one long side. Pinch edges to seal. Cut roll into 1" thick slices and place in 2 lightly greased cake pans, with sides touching. Preheat oven to 375º F. Bake for 16-18 minutes or until golden brown. Cool in pans on wire racks for 5 minutes. Remove rolls and cool completely. When ready to serve, thaw completely and heat in a 350º oven just until warmed. 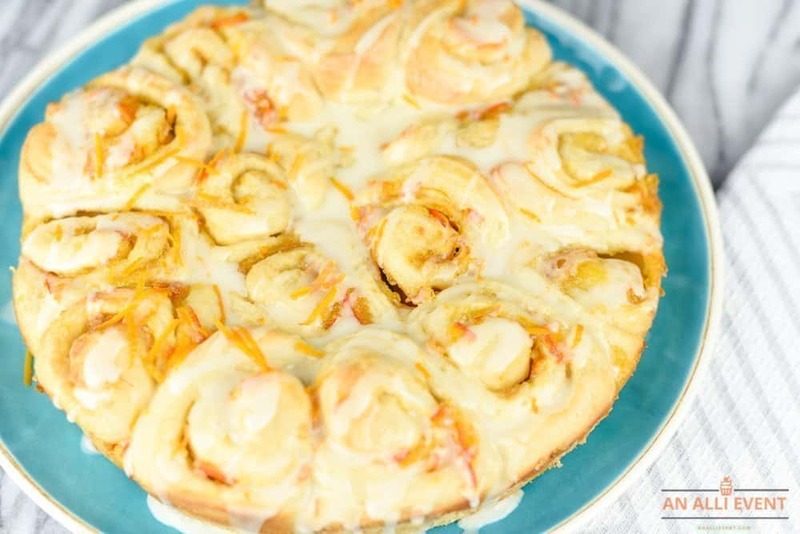 Drizzle orange rolls with icing. Grate zest from orange to equal 2 teaspoons. Cut orange in half and squeeze juice to equal 3 Tablespoons. Stir together orange juice, 1 teaspoon orange zest, powdered sugar and whipping cream until smooth. Drizzle over warm rolls. Garnish with remaining teaspoon of orange zest. Stocking up with FoodSaver® bags and rolls this harvest and holiday season has its perks, every bags and rolls purchase gets you closer to NYC! Hurry and enter by clicking the badge below! Sweepstakes runs from 9/23/18 – 10/21/18. When it comes to holiday entertaining, I depend on the Foodsaver® FM5330 to plan ahead. 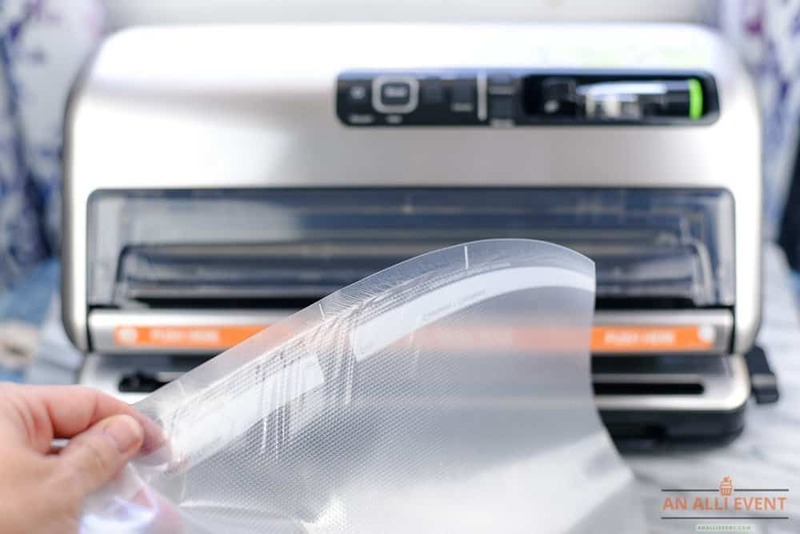 When it comes to long-term freezer storage, the multi-layer, BPA-free vacuum-seal bags are the best for blocking out air and helping to prevent freezer burn. 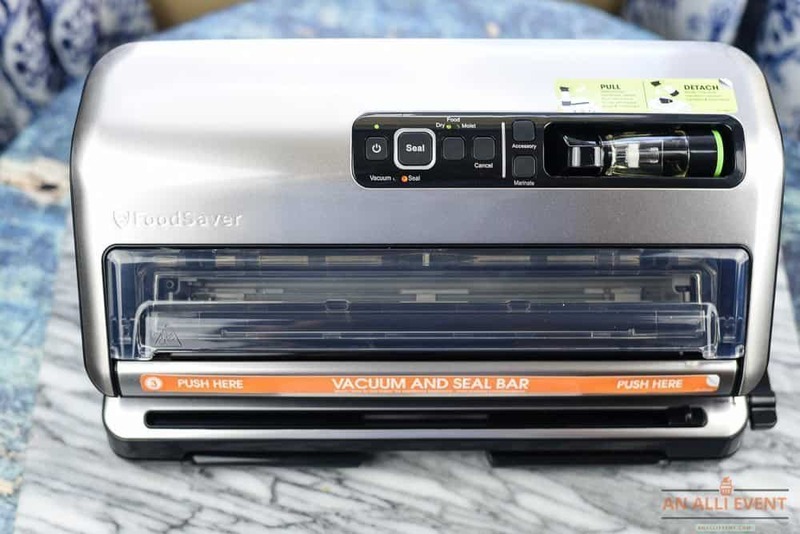 This is another reason I trust my FoodSaver® FM 5330. 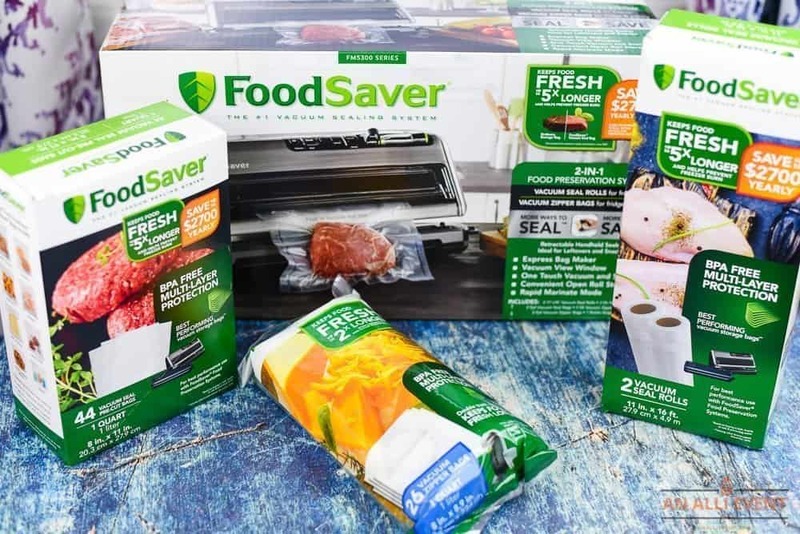 With the holidays around the corner, I also make sure I stock up on plenty of FoodSaver® Heat-Sealed Bags and FoodSaver® Heat-Sealed Rolls. You can purchase them both at Bed Bath & Beyond. I love that these can be made ahead of time. I am hosting a brunch in October and I am totally adding these to my menu!! Yum, I must make these! We enjoy sweet rolls. I haven’t tried an orange version of them yet, so that’ll be a delicious surprise. Nobody ever turns die sweet rolls. They freeze really well so I like to make several pans and have some friends n hand. This looks like an awesome storage system to have on hand especially with the holidays right around the corner. Can’t wait to try this recipe. I might try to make this for one of my daughter’s volleyball games for them to snack on on the bus. Glad you shared the recipe to us. Those swirls look so good and tasty. It is so smart to save meals and special dishes for a later time and then it is ready. Orange or lemon rolls is one of my favorite bread. In fact I made this last week and my family loves it. It is also great with ice cream on the side. Those orange rolls sound (and look) tasty. I’m saving this recipe for later. I don’t think I’ve ever had anything like these Orange Sweet Rolls. Usually I have only seen cinnamon ones. I would love to try making these, as they look amazing. The FoodSaver is one of my favorite kitchen accessories! It makes stocking up on bulk meat easy and quick. I love making orange sweet rolls from scratch! Your recipe looks so flavorful and delicious. I look forward to baking up a batch of this homemade goodness. Yum. Yum! Ohhh, seeing this orange sweet rolls is definitely making me drool and wanting to have a taste of it. Taking note of the recipe and the seal too. I have a food saver! And I love orange sweet rolls! I am so excited about making these, I can’t even tell you. What a fancy vacuum sealer. I want one! Oh, I can smell the orange marmalade. I would love to try this recipe. Thanks for sharing! I’m surprised it protected the volume of the sweet rolls when you vacuumed out the air! I really want one of these for our home, too. 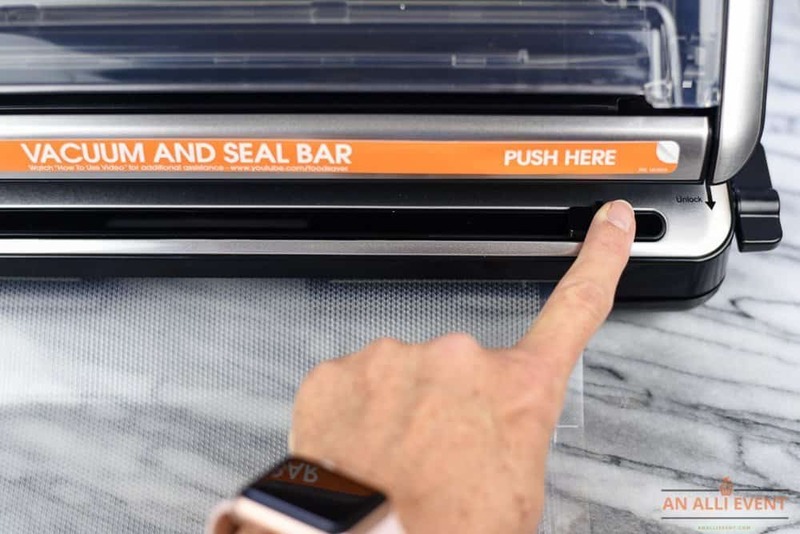 Like I stated in the article, you must freeze the orange rolls on a cookie sheet until frozen solid before using the FoodSaver® and vacuuming out the air. If you don’t, the rolls will flatten. This is something I would love to make for the family. This is the kind of stuff they love! I’m definitely going to make this for my family. I bet they would love it! It’s not often that I use orange in desserts. I think this is a great idea! Perfect when you have people coming over unexpectedly. I’d love to keep the recipe! I’m thinking about getting that food saver too, so convenient to have at home! Venue setup will not be a problem for you anymore your Caterer can do it perfectly for you. Your Caterer will do all the cooking for you. Food cooked by expert caterers are at par with 5 star hotels.